So far the only equipment you might be behind on is the cream siphon. If you already have one of those then you can make the foamed chocolate. There are lots of interesting confections that involve hard candy with a central core or layers (like a crispy crunch bar - not sure is that is just a canadian thing) and those will require some way to keep the sugar mass soft while manipulating. I was looking up sugar lamps - they seem to run in the $500 to $1000 range and that is too rich for my blood. I'm sure I can get hubby to jury rig something. I suspect a marble slab with a silpat and some sort of heat source will work. I wonder if I could just use my heat gun as required to warm up the mass? kerry, when doing sugar showpieces, one of my colleagues uses the microwave as well to rewarm sugar that has gotten too hard to work. you can definitely rig something using a powerful spot/heat bulb. there's no reason to pay $500 just because it says it is made specifically for sugar work. it doesn't need to be HOT, just enough to keep the sugar pliable. Those are one of the candies in the book. He shows making then with an almond center, but also has a recipe for a peanut butter center. When is your copy due to arrive? I just found a 175W clear infared bulb on eBay for $5 which you could probably just put on a gooseneck lamp. I'll bet you could construct a sugar box of plexiglass and one of these lamps for less than $30. Is there anything special to look for in a cream siphon? Any old cream siphon should work. I was looking at some gorgeous big ISI units today at the cooking store where I teach, those would allow you to make a nice big batch of the holey chocolate, but I've never bought a new cream siphon, I find all mine at thrift stores for about $5. The one I'm currently using holds 500 ml. I bet if I search this house there is a heat lamp somewhere that I can make use of. When I tryed work with sugar I used my hubby working lamp ( name?) anyway that thing is pretty hot and it kept the sugar warm. This book is by far the best book for someone who wants to learn to become a professional chocolatier or for those pastry chefs that want to learn or open their eyes a little bit more to chocolate. Unlike most of the other books (with the exception of Wybauws), this book is more geared to professionals. I own a tone of chocolate books, including books by Andrew Shotts, Recchuiti, Nick Malgieri, etc. and none of them seem to be geared for a professional kitchen or student, but more for the weekend warrior. Actually, those other book (again, with the exception of Wybauws) tend to confuse or contradict a lot of things I learned in school and tend to confuse or screw things up. This book by Peter Greweling actually helps you to understand why things are happening and how to avoid or correct a problem at the same introducing you to new techniques. He also seems to gear the recipes for a commercial kitchen environment. If I would have to decide on one book, this is by far the best book out there, at least in my opinion. I would even recommend this over Wybauws book, because it seems to go into more detail at a less confusing way (you can say an easy read). Again, this is just my opinion and you may or may not agree. Bang on!! What I have found is this book consolidates the info from a lot of professional books I have, but is the first one I've seen where all the info is in one place. I don't think you need to be a professional to benefit from it though, the weekend warriors will learn just as much. I will get the book, but, for now, what is a cream siphon? Wow, I didnt know Peter Greweling put out a book. I had him as an instructor about 3-4 years ago at the CIA. I learned so much from him and I still have all the notes and recipes from the class. The book sounds great, ill look into getting it. I'm currently waiting to receive my copy from Amazon. It already seems as if this book is going to become one of the definitive books on the subject. Do you folks think it is still worthwhile to get a copy of Wybauw's Fine Chocolates: Great Experience is one already owns the Greweling book? Of course, you can never have too many good chocolate books! I completely agree, I am so impressed with this book because is seems to be all-inclusive. It has many different techniques in it that I haven't seen discussed anywhere else, or if they were discussed, it wasn't in as great a detail. I love the pictures and the troubleshooting tables. I still can't believe it was only $40.95 at Amazon. With its 388 pages, the many color photographs and the measurements given in metric, oz and percentages (plus yields on every recipe) this is the best book I think I own so far. I have a lot of the other chocolate books that are out there and like ChristopherMichael said the only other one that comes close is JPW's book which is nice because it is really technical and it has much information about shelf life. I made my first recipe from the book last night, although it hardly counts. I was testing out a bunch of different peanut butter formulations, so I tried the peanut butter guanduja (which is in the book in the section on jellies, as it goes with a raspberry jelly layer in the book). Anyway, as I said - hardly counts, as it was just 2 parts milk chocolate to 1 part peanut butter. Tasty, though, and great texture. I ended up opting for a different kind of preparation, but I'm sure I'll end up using this one later. Today I'm planning to try following his slab ganache technique to the letter, in the hopes that it will help me with some texture problems I've been having. He's very strong on the use of tempered chocolate in ganache, which is a conversation we've had in other places on the forum. Previous discussions have mostly been around its effect on shelf life and water activity, but Grewling claims that it's essential for proper texture and crystal formation in the finished ganache. Any thoughts? I've got a little too much to do today already, but sometime I'd like to make two batches side by side - one tempered, one not - and see if I can tell the difference. This is a very interesting experiment! From my point of view, the difference in quality would have to be substantial to justify the extra time and effort to temper the chocolate for ganache. Do post your results. I tried the coffee ganache from the Hazelnut Latte, I don't really know if it was worth the extra steps. Mine turned out kind of 'waxy'. It was firmer than I thought it would be, I like mine to be softer. I also tried the Apricot Butter Gancahe, it was the first time I've tried a butter ganache, and I quite liked it. The alcohol flavour was way too strong, but I liked the texture. It was firm at first, but then it kind of melts away. I haven't made any actual recipes from the book yet, but I did use his slab ganache technique and explanation of ratios to reformulate two flavors I'm working on for Easter, cardamom and raspberry. I used my new cutter from Tomric to cut all the ganache into little egg shapes, thinking I'd need to leave them out to dry overnight before dipping tomorrow. However, the book seems to indicate that he dips the pieces immediately after cutting. Any thoughts on this? Is it because he's using a fairly stiff ganache to start with? Tammy - when we were using cutters at school, we left the slab of ganache overnight to set up and then cut the shapes out and dipped immediately. I'll definitely do that next time - it'll make production much easier for me anyway, since long wait times are a problem for me. By the time I figured this out on Friday, I was way too tired to do anything but crash, and then by the time I got to them on Saturday, they were decidedly drier than I would have preferred (I did cover them with saran, but not well enough). Live and learn - luckily these aren't for anyone in particular, just testing. My copy finally arrived in the middle of a very busy weekend. I have just begun to skim through and am just thrilled. This book seems to hold all of the information I have been ferreting around trying to gather for years. It is more thorough than any other book and provides so many more answers than that online course I took a few years ago. It seems to unlock some of the secrets of chocolate that have been so difficult to unlock previously. And for practically free! It's almost a shame, all that info right there for just anyone to use. They don't have to work for it like all of us have. I said something to my online instructor about the secrets of the industry and she said there were no such secrets. hmmmm. time to blaze some new trails I suppose. I was looking for something really easy to do at the weekend so I made the 'Mint Meltaways'. This recipe was incredibly simple as you did not need to temper the chocolate you just melted it and added melted coconut fat and the mint oil. I used half plain (60% cocoa) and half milk chocolate but would use a bit more plain next time. The mixture is worked for a little on a marble slab and then framed once it is cool. The mixture is then cut up and the pieces dusted with icing sugar. This is quite a rich mixture with 23 percent coconut fat but I really liked the melting texture and am keen to try it with a few different oils like lime and cardamon. Having the recipes in percentages makes it so easy to scale down as I did for this one as I only wanted a few pieces not 48 oz. I think it is a lovely to book to work with - very clear layout. I agree. I love the combination of measurements and the percentages. It had me practicing my long unused algebra skills this weekend. I was developing a ganache formulation using his guidelines. I knew what volume I wanted to end up with to get the thickness I was looking for in the size frame I was using, so then I had to figure out how much of each ingredient to use based on his theory of ganache creation. I always loved algebra, so I found this strangely fun. Phew, I finally had some time to make something from the book this weekend. 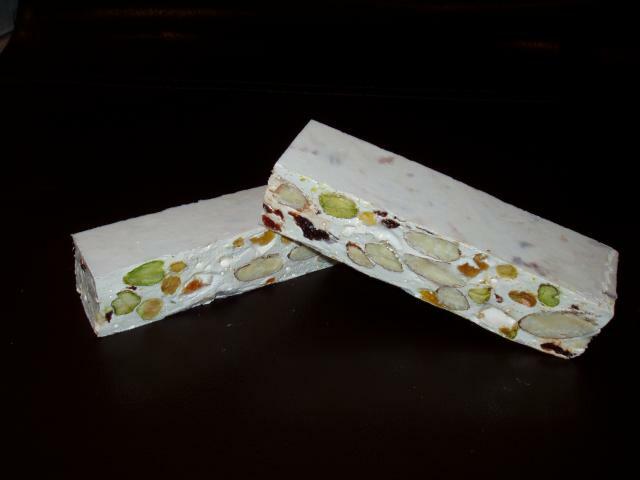 When everyone was still asleep I whipped up a batch of nougat and it was sooo good. I couldn't wait to cut into it so it was still a little soft at the time, but that didn't matter. The only thing I would do different the next time is leave the cherries whole rather then quarter them. Because they were quartered they left some streaks when I tried to stir them into the sticky nougat. But again, that didn't affect the flavor, so it was all right. Great recipe, great flavor, just the food cost is a little high at about $15 per batch (and this was using a cheap honey too...) Now I can't wait to try the aero bars and the soft caramels. My poor crowns... my dentist is going to have a field day.